ok.. i want to make a virus remover/scanner tht deletes files og scans for virus.. Just reply i you know some of codes or if you have a project. I do not have projects for share, and my projects are written in C#. To, only build a virus removal tool, you need to know what such tool is! What is a Virus Removal Tool? AV-program which will only search for a specific infection, through MD5-hash or SHA-hash. I have some more details on what I told you before, the MD5-hashes or SHA-hashes are known as "checksums". The smartest thing you can do, which I've done on my antivirus, is to make byte segments of files. This means the scan engine, will split the files into segments, and since you only scan for one specific (because, you wanted to make a Virus Removal Tool), you just make a built-in data base which will become “hard-coded”, anyway, the system works like this. You use a advanced HEX-editor, and you have only one specific virus infection (let’s say: “Win32_@Virus”), then when you know the byte sequence of that specific part in the HEX-data, you’ll have to make a MD5-hash or a SHA-hash of only that specific part. Why? Because, that specific part will be the code which will perform the “infection” on a specific file-type on the computer system. However, by having that specific hash of that specific hex-line data, you can prevent this, since the scan engine will split the file bytes into segments, this allows you to check each hashed segment against that original “virus” hash (See Figure 1.1, below). algorithm. 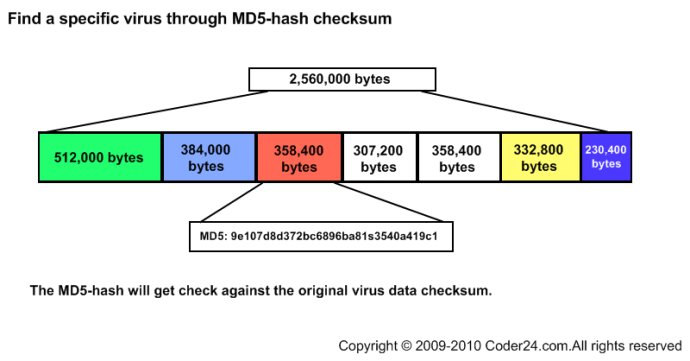 Next, each of the MD5-hashes will get checked against the "virus" checksum, or MD5-hash. I am back with more updates. I’ve been analyzing the Aids (Malware name “HLLPo-Number 1-A”) virus HEX-data and its original source code. Fig 1:5: The original Aids virus source code, it's written in Pascal. Now, as I did a scan with Avast Antivirus Free Edition, it alerted me that the file is infected. I agree, because the file is a virus it's self. Fig 2:5: Avast alerting that the AIDS.COM file is infected. Now to put this in perspective, I analyzed the virus HEX data. Fig 3:5: EA is the virus infection area which Avast detects. Now, I deleted that, and I saved the file and re-scanned with Avast. Fig 4:5: I deleted the EA HEX value, and I saved the file. Fig 5:5: A re-scan using Avast. Avast, does not find any infections in the file. You can download the virus and it's source code for researchers only. the virus (details provided by the author). If you have other questions feel free to ask! you can download source code from here! its gave you idea how to make ! If you need help, then feel free to ask.